Lookalike Audiences is yet another powerful tool Outbrain provides that enables you to narrow in on the most engaged and scalable audience for your content. By mirroring the behavioral patterns of your existing customers, Lookalike Audiences will dynamically seek out other users who are more inclined to perform the actions you intend. Lookalike Audiences can be built from Custom Audiences previously created in your dashboard or by integrating audience lists from 1st party data providers. Note: this option is only available if you already have access to a 1st party data provider. Custom Audiences are a great way to pool together users who have visited your site, made a purchase, or even viewed a previous Outbrain campaign. To start, head to the “Audiences” tab, where all of your current audience segments are stored. Click “Create Lookalike” at the top of the page to open the Lookalike menu. Select your Custom Audience segment from the drop-down menu. If the segment is too small to build from, the option will be grayed out. Select the combinations of location and device that you wish to target. You can select up to six combinations per Lookalike segment. If a combination isn’t available, this means there isn’t enough data yet in your seed segment for us to model that combination. Once you’ve selected your combinations, you will see your “Potential Reach.” This tells you how many people are currently available across your combinations. You can adjust the similarity percentage by dragging the yellow circle left or right, and the “Potential Reach” will update accordingly. We recommend starting with a 5% audience similarity, which will give you a precise audience match while maintaining scale. Finally, you’ll see the expected creation time – which will take about 2-3 hours – and your Lookalike name. This is automatically populated from your seed segment and combination selection but can be changed by clicking on the pencil icon. After reviewing any changes you made, click “Save”. Your segment will now be available to view in the main “Audiences” dashboard. To review the list of combinations and potential reach, you can click the expand button at any time. In Progress: Our System is generating the Lookalike segment based on the selected seed segments and targeting (this process takes approximately 2-3 hours). You can still target your campaign to the segment and the campaign will launch when the segment is fully prepared. Partially Ready:Whenever you edit a Lookalike Segment with additional targeting, those new changes take 2-3 hours to take effect. The original parts of the Lookalike Segment are still active and can be used in your campaign. You can still target your campaign to the segment. Once the new combinations are ready, the campaign will start using the segment for targeting. In the main dashboard view, select the campaign you wish to add the Lookalike segment to and click the pencil icon to open up that campaign’s settings. You can also add Lookalike Audiences to new campaigns when creating them. 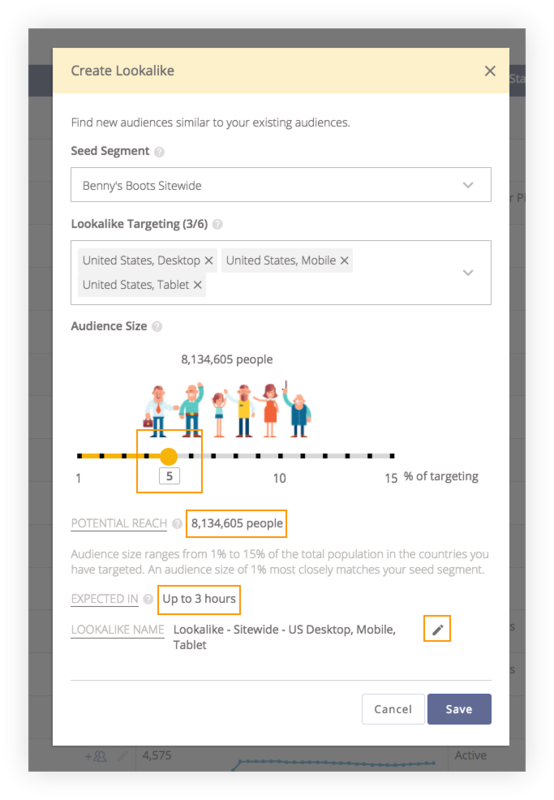 Scroll down to the “Include Audience Segments” field in the Targeting section and select your Lookalike Audience. By hovering over the segment, you can see which combinations were selected. 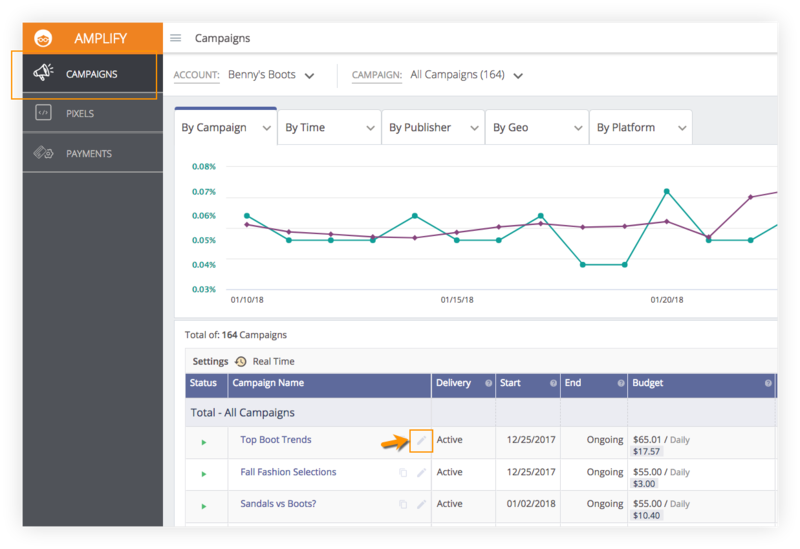 To the right, the Reach Estimator will show your projected monthly reach using the Lookalike Audience and any other targeting options you have chosen. Once you have made all the necessary changes to your campaign’s settings, go ahead and click “Save”. 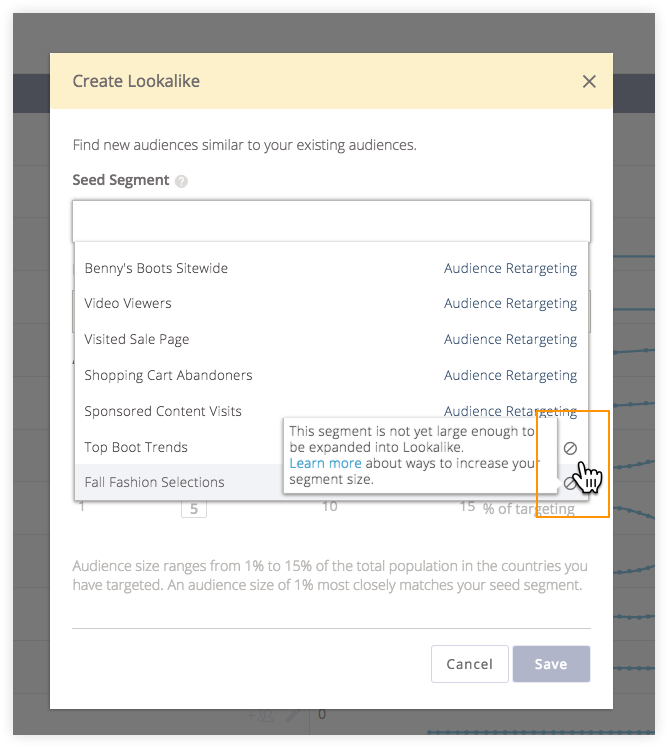 If your segment is showing this message, it means that the users collected in your Lookalike segment do not have enough similarity between them in the audience seed segment. In other words, the users in your Lookalike segment are very different from one another! It also means that model we build will not be specific enough. This could be because your seed segment has too wide a variety of non-similar users, try narrowing your segment to more alike ones. Need help on making your segments more narrow and specific? Reach out to our friendly support team! Can I build a Lookalike from my own audience lists? Yes you can! As long as you have an account with one of our partners you can import your own 1st Party Data! Why is my segment size so low? Lookalike audiences are based on the seed segments (which are built from Custom Audiences or 1st Party Data) and the targeting you select. 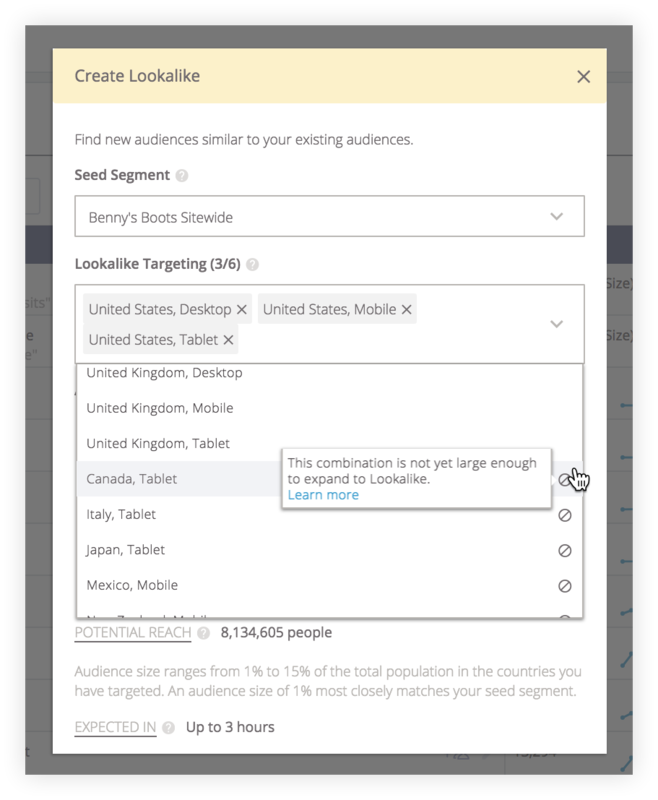 If your seed segment doesn’t have enough users, our system won’t be able to generate a large audience, especially if you set the audience size to less than 5% of targeting. In addition, if your targeting is too specific, it can result in your segment not having enough reach. We recommend when creating your Lookalikes, keep an eye on the Potential Reach to ensure that it’s not too low. In addition, if you target your campaign to a Lookalike with low Potential Reach, it can result in your campaign having scaling issues and not performing well. Start with a higher CPC than you would for a run-of-network campaign, and make sure to consider the size of your segment when deciding what to choose. The more similar the audience, the smaller the scale. If you choose a 1% audience similarity, the CPC should be higher than a 15% audience similarity. Try building a Lookalike with several different combinations (of device and location), then create multiple campaigns to target individual devices or locations. This allows you to test what works best, all using the same Lookalike. Rather than adding a Lookalike segment to an existing run-of-network campaign, it’s best to duplicate the existing campaign and start fresh with a new copy. Currently, Lookalike Audiences only supports select languages in each available country. See if your country and language qualify. If you disable the audience segment that your Lookalike was built from, it won’t affect the Lookalike segment. However, adding new users to your seed segment will affect the Lookalike segment, since the segment updates dynamically. You can create up to five Lookalike segments per seed segment, can select up to six combinations per Lookalike segment, and can target up to three Lookalike segments per campaign. You cannot duplicate a Lookalike segment from a starting audience segment using the same similarity percentage. For example, you cannot create two distinct Lookalikes at 5% similarity from the same seed segment. When you create a Lookalike segment you can have multiple combinations but we recommend to only add 1 location and 1 platform because when you add the segment to your Campaign, only the targeting that matches the Campaign’s targeting will be used. Last but not least, if you have any questions about how Lookalike Audiences works or how to optimize your Lookalike campaigns, don’t hesitate to ask us.